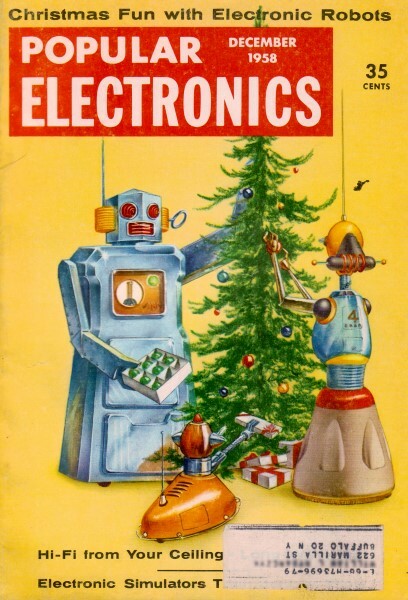 Here is a Christmas-themed "Carl & Jerry" episode from the December 1958 issue of Popular Electronics magazine. Carl & Jerry, if you are not familiar with them, are a couple electronics-savvy teenagers who, in the style of The Hardy Boys, manage to get involved in a series of criminal investigations. With headquarters based in their parent's basement, the two friends cobble up strategies and contraptions for snaring bad guys, bedazzling unsuspecting neighbors and classmates, and assisting people in need of techno-capable assistance. They have quite an impressive collection of test equipment and radio gear at their disposal per the one drawing herein. In this episode we are introduced to the word "osculation." If you already knew its definition, you're one up on me. "For the last time, no!" Carl shouted at his friend, Jerry, sprawled on the old leather divan of the basement laboratory; "I'm not going to take your visiting cousin Patricia to the Christmas party." "And why not?" Jerry demanded truculently. "With those blue eyes, black hair, and dimples, she isn't exactly a crow, you know. And didn't she win the science award? She knows darned near as much about electronics as we do. Lots of guys would jump at the chance." "Let 'em jump," Carl said firmly. "I'll not deny she's easy on the eyes, quite hep, and nice, too, for a girl. It's simply that I've had it as far as these Christmas party capers are concerned." Jerry exchanged a knowing look with his chum. "Mistletoe?" he asked sympathetically. Carl nodded vigorously. "Yep. Last year Cindy Hawkins, who goes around with her lips pursed all the time like a goldfish, got me talking about radio and somehow maneuvered me under a sprig of the stuff. Before I realized it, she was looking up into my face expectantly and batting her eyes like a toad in a hailstorm. Then some joker spied us and yaks, 'Gwan; kiss her, Carl. You chicken or somethin?' I was trapped like a rat," he finished with a shiver as he drew the back of his hand across his mouth as if to erase the thought. Jerry's round face took on the bland, cherubic look it got when the little wheels inside his head were racing like mad. "If I help you give Kissing Cindy the cure, will you take Pat to the party?" he asked rather hopefully. Carl's face wrinkled into a suspicious frown. "Let's hear your idea before we make any deals." "It's beautifully simple. You'll wear a few of these miniature B- batteries connected in series to produce about 130 volts; a current-limiting resistor will be inserted between the positive terminal and an electrode taped to your skin. The negative lead will connect through a small wire to your metal wrist-watch band. We'll spray the inside of this band with plastic spray to insulate it from your arm. Now, when Osculation Hawkins corners you under the mistletoe, you casually bring the wristband in contact with her arm and let her have it right smack on the kisser. Do you get the picture?" "Yeah-h-h-h," Carl breathed with mounting enthusiasm for the picture in his mind's eye. "Girls are afraid of electricity anyway. Man, I'll take the curl right out of her hair. We'll cure her of this smooching habit, but good!" "Sure, why not? But let's get started on this mistletoe antidote." The boys had been so interested in their conversation they failed to notice a slender, blue-eyed girl who had started down the basement steps in the other room a few minutes before and had paused to listen to their conversation. Now, with a thoughtful look on her face, she turned around and tiptoed back up the stairs and out of the door. Once his word was given, Carl did things up brown. A pretty little corsage was delivered to Pat the afternoon of the party, and Carl showed up that evening looking scrubbed, handsome, and dressed in his best. Pat was lovely in a deceptively simple dress with Carl's corsage at her shoulder, and her only jewelry was a heavy silver bracelet. Jerry's "date," a neighbor girl from across the street, was already there; and the four young folks set out for the party in high spirits. "It's beautifully simple," Jerry said. "You'll wear a few of these miniature B- batteries connected in series to produce about 130 volts"
The party was in full swing when they arrived. As the boys helped the girls off with their coats, Carl caught sight of a sprig of mistletoe fastened to the chandelier and favored Jerry with a broad knowing wink. Blonde Cindy Hawkins, her scarlet mouth standing out starkly in her white face, spied Carl and started making her way in his direction immediately; but before she reached him Pat intercepted her and practically dragged her off up the stairs. This struck Jerry as a little odd at the time, but he had no time to think about it because he and Carl were caught up in a boisterous "ice-breaker" game that was just starting. A few minutes later, though, he glanced up to see Cindy and Pat descending the stairs with their arms about each other's waists. 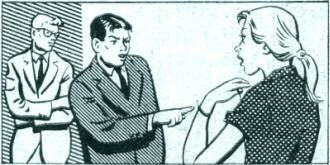 In passing he idly noticed that they had exchanged bracelets. Pat's heavy silver bracelet was on Cindy's right arm. The hostess had planned the party well, and for almost the entire evening everyone was kept so busy with interesting, hilarious activity that the mistletoe got no play at all. But finally, after refreshments, Jerry saw Cindy artfully guiding an innocent-looking Carl under the chandelier. They stopped beneath it, and Carl allowed his gaze to follow the girl's to the branch of mistletoe; then, with a wicked smile of anticipation on his face, he slowly lowered his face to hers as his left arm casually searched for her right. Just before their lips met, he heard a little "clink" as his watchband touched her bracelet. "All the better contact!" he thought gleefully, bracing himself for the shock that he knew was coming. None came! In a panic he felt her warm clinging lips against his. Maybe the lipstick was acting as an insulator! Deliberately he rocked his head from side to side so as to reach an unprotected area. There was still no shock; but he could hear hollowly ringing in his ears the jeers and admiring wolf whistles of the other kids, "Break it up, Lover Boy...that will never get past the censor...hey, how about coming up for air!" Carl stepped back and looked around with glazed eyes at the ring of grinning faces. Then he bolted for the kitchen, pausing only long enough to grab Jerry by the coat collar and drag him along. Inside the kitchen, Carl slammed the door shut and leaned against it as he used his handkerchief to scrub the crimson lipstick from his mouth. "You and your stupid ideas!" he grated as he scowled down at Jerry. 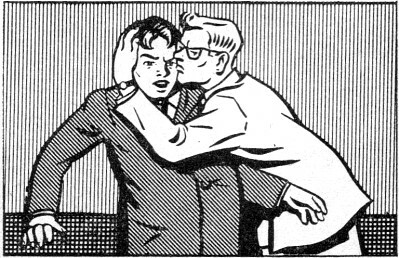 Suddenly he grabbed his rotund friend and roughly pushed his wrist watch against Jerry's right cheek while he pressed his lips firmly against the left cheek. "Testing, testing, testing!" he muttered. "Hey! Cut that out! Quit slobbering on me!" Jerry said indignantly as he jerked himself free. "What's the matter with you? Did you catch Cindy's kissing bug?" "Did you feel anything? Did you feel a shock?" Carl asked intently. "Sure I did. Why shouldn't I?" "I felt it then, too, but there was nothing when I kissed Cindy. What could have gone wrong?" Carefully the boys checked every connection of their electronic mistletoe antidote. Everything was in perfect order. Mystified, they finally went back to the party, only to discover that it was breaking up. In spite of himself, Carl let his eyes meet Cindy's and flinched at the amused mocking expression in them. He glanced away quickly and saw almost the same look in Pat's blue eyes, but there it seemed to be tempered with sympathy. As the boys and girls put on their wraps, they were still razzing "Hot Lips Carl" about his sizzling technique under the mistletoe. He did his best to take it good-naturedly, but Jerry knew he was writhing inside. As the four of them walked home through a gently falling snow, the girls tried to keep up a lively chatter about how beautiful the lighted Christmas trees looked in the windows and how sweet the muffled Christmas music that seeped out of nearly every home sounded in the night; but the boys had little to say. Carl was morose; Jerry seemed to be miles away and buried in thought. After seeing Jerry's companion to her door, the other three crossed the street and went into Jerry's kitchen, where his mother had left a plate of cookies and some hot chocolate for them. They still had little to say until suddenly Jerry reached over and spun the silver bracelet Pat was again wearing on her arm. "Cousin Pat," he exclaimed, as he stared down at the bracelet curiously, "You are a traitor!" The girl opened her blue eyes wide as she set down her cup of chocolate. "Whatever can you mean, Jerry?" "This is what I mean," Jerry said, and he touched a little broken end of fine wire that had been fastened to the bracelet with a speck of solder. For a long second the two cousins looked straight into each other's eyes, and then they simultaneously collapsed into peals of laughter. "If someone would tell me what was so funny, maybe I'd laugh, too - and I could use a laugh," Carl said plaintively, still somewhat depressed. "I may as well confess," Pat said, wiping her eyes with a wisp of a handkerchief. "I happened to overhear you boys cooking up that deal on Cindy. I didn't object to that in the least, for her type has it coming; but I did mind very much, Carl, your acting so stuffy about taking me to the party. I don't like to think that any of my escorts have to be bribed." A wave of red came up out of Carl's collar and spread over his face. "I decided to get even, and it was very nice of you boys to furnish all the details I needed about polarity, voltage, etc. 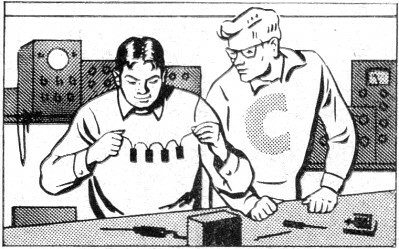 Since I knew that if two equal sources of potential are connected together, positive-to-positive and negative-to-negative, no current flows, all I had to do was rig up a battery identical with the one Carl was wearing and persuade Cindy to wear it. The negative lead was connected with a very fine piece of wire to this bracelet of mine which is insulated in the same way your watch-band is." 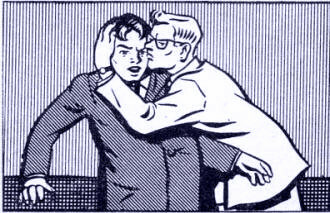 Suddenly he grabbed his friend and roughly pushed his wrist watch against Jerry's right cheek while he pressed his lips against the left cheek. "I get it!" Carl exclaimed. "Cindy maneuvered so that my watch touched that bracelet instead of her skin. That connected our separate batteries positive-to-positive and negative-to-negative." "That's it," Pat said, her face sobering; "and let me say, Carl, that I am sorry. I do feel like a traitor. I want you to know, though, that your precious woman-hating reputation is intact. By this time everyone at the party knows that you were double-crossed and that you didn't suddenly change character under the mistletoe. Only your pride is hurt." Carl stared down at his wrist watch for several seconds, but when he raised his head his blue eyes were twinkling behind the horn-rimmed glasses. Swiftly the twinkle spread into a grin, and in a moment all three were laughing together at the memory of the evening. "All is forgiven, Pat," Carl said at last. "Any time a girl can make fools out of a couple of guys who like to think they are electronic hot-shots - and at their own game, mind you - she's all right. From now on Jerry and I want you down in the laboratory instead of up here. You belong with us." They went back to chatting and laughing and drinking chocolate. Even though December 25th was still a few days away, the beautiful, warm, companionable feeling of Christmas swirled about the three young people in the kitchen.